I admit, it’s kind of silly to even suggest that there’s a “best gut healing soup.” Any REAL soup, made from real, homemade bone broth, has powerful gut healing qualities. There are literally, thousands of examples from traditional cuisines all around the world. 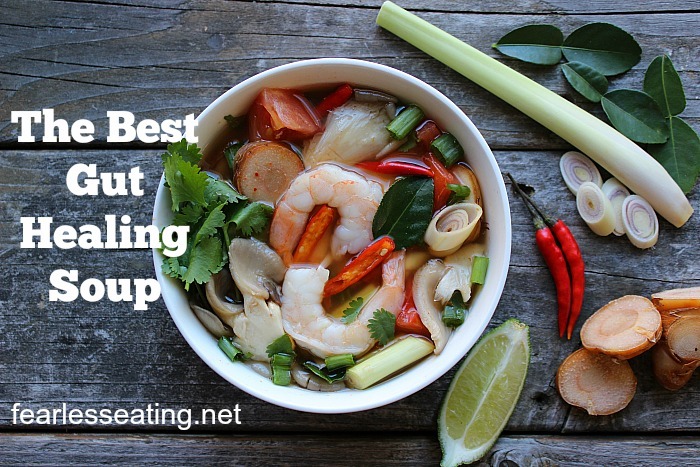 But if there was an actual competition for the best gut healing soup, I’d nominate Thailand’s most famous soup, tom yum (a simple type of hot and sour soup), because I think it fulfills four important criteria for any gut healing soup. 1. Tom yum is naturally gluten-and dairy free. 2. Tom yum is broth-based and is thus easy to digest. 3. Tom yum contains powerful medicinal herbs and roots. In particular, it contains the three classic Thai ingredients of lemongrass, galangal and kaffir lime leaves. , I cite 16 scientific studies that show a wide range of benefits to these classic Thai ingredients including anti-microbial properties (source, source, source) immune-boosting properties (source) and even anti-cancer effects (source, source). 4. Tom yum is ridiculously simple to make. As you’ll see, the video below for how to make tom yum goong (“goong” means shrimp in Thai) is a promo video for the sales page of my new book But it’s also a great example for how easy it is to make many types of broth-based Thai soups. And that’s one of the reasons I wrote the book. In my travels in Thailand I realized there were SO MANY simple gut-healing soups that few people in the West know about. So I specifically focus on SIMPLE soup recipes that can easily be recreated in the West. And there’s no better example than tom yum goong. Want the Recipe for Tom Yum Goong Plus 39 More Mouthwatering Thai Soup Recipes? 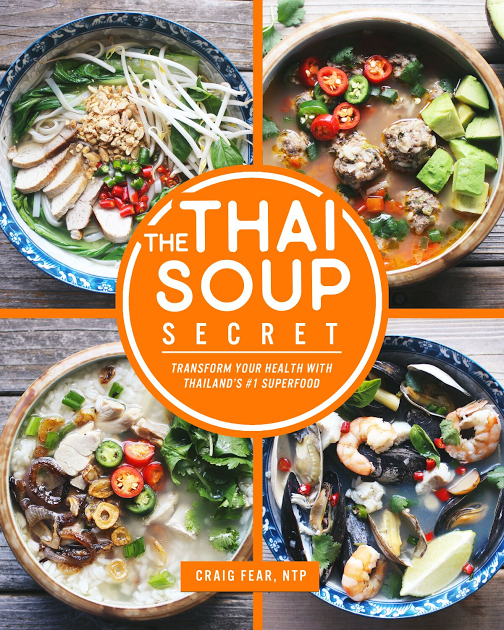 Download the Thai Soup Secret right here!